Since the inception of the Labour Relations Act, the field of labour law in South Africa has been considered highly technical and frought with pitfalls. There are various technical elements which employers and employees are not always aware of. The Labour Relations Act has actually brought about a sense of legal certainty in the workplace. This may act to the advantage of employers, if used correctly. 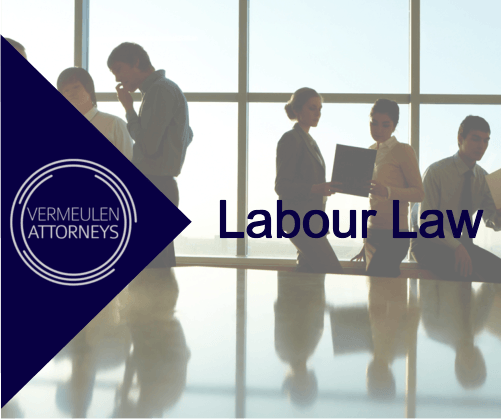 Vermeulen Attorneys’ specialist labour law attorneys are able to help. The field of Labour Law in South Africa was dramatically changed by the introduction of the CCMA.The CCMA is a unique forum, with its own rules and processes. It is extremely important, when dealing with CCMA matters, that these rules and processes are understood and adhered to. Our attorneys are specialists in CCMA litigation, and attend to matters in the CCMA on a daily basis.Vermeulen Attorneys are able to assist you with all facets of CCMA litigation. A disciplinary hearing must be held in cases where an employer believes their employee is guilty of misconduct. The purpose of the disciplinary enquiry is to find out whether the employee has indeed committed misconduct. A Disciplinary Enquiry is a critical step, which must be taken prior to action being taken against an employee. In the hearing all parties involved will have an opportunity to state their case. Our specialist labour law attorneys frequently chair disciplinary hearings, and act on behalf of parties to disciplinary hearings. The Labour Court carries the full status of a High Court. The only difference between a Labour Court and the High Court is that the Labour Court only deals with labour matters. The Labour Court may be approached directly in some cases, and may also serve as a review court if a party wishes to challenge an order made by a CCMA Commissioner. Our labour law attorneys specialize in matters involving the Labour Court. Our attorneys also appear personally in the Labour Court.